Trudy Barber Arts: Magic and Logic - nearly finished!! March has been so hectic - lots of teaching and lots of painting for the Deadalus Ward for Dementia at Gosport War Memorial Hospital - too busy really to make a note on this blog! 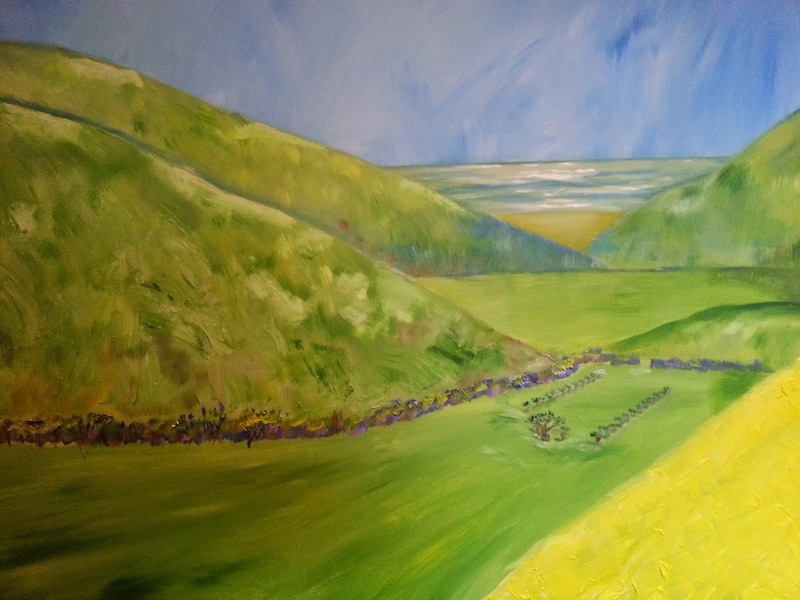 But here is the update - I have managed to complete a further three paintings and am about to start the final one. I am taking some time off from my university teaching in the spring break in order to bring this specific project to a close. 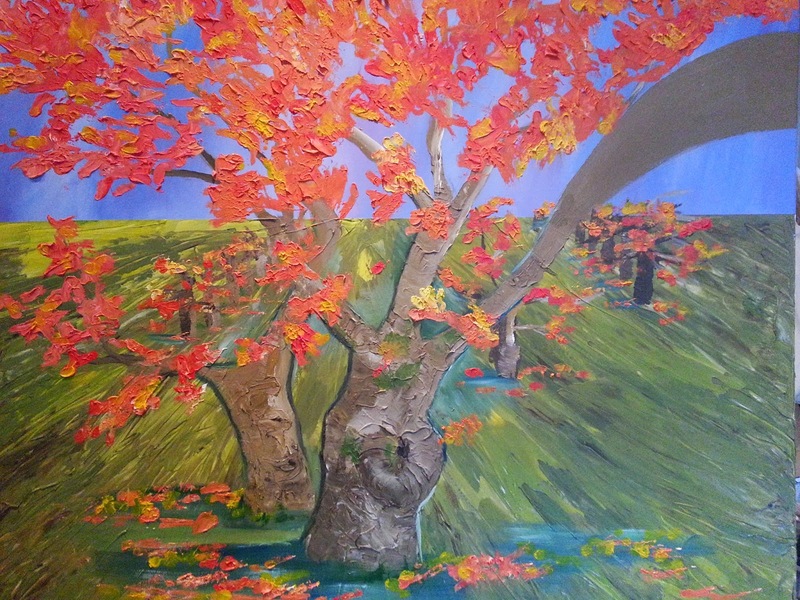 The final painting in the tree sequence is complete, and two of the landscapes are also complete. The work is very simple, stylised and redolent of archetypical representations usually associated with childhood. Below is the final tree in the sequence - Autumn. I will be putting the words of the patients and staff used to describe the seasons on the right hand branch of the trees. So below is a picture of how these trees will look all together. As you can see they are taking up much of my kitchen at the moment! 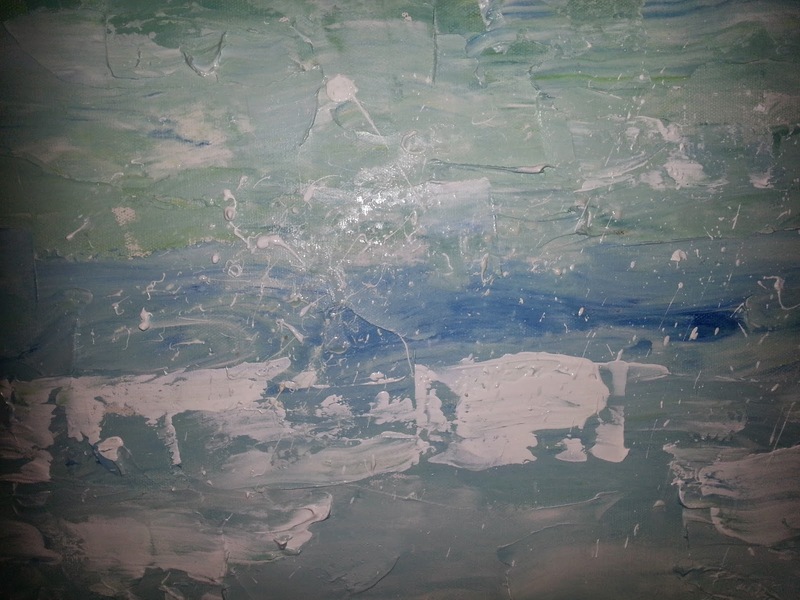 The next three paintings are part of the narrative of the painting sequence as a whole. The work is to be viewed as one whole piece rather than seven separate pieces. The fictional landscape contains the trees. The aim of the landscapes are to try to build a basic narrative as patients take the time to move along the corridor where the work is to be displayed. This may help staff to engage in that narrative with the patient. If the patient cannot remember one image to the next, there are other aspects of the work that can also be explored, such as texture colour, shape and form. This simple and bright landscape also has the sea in the distant horizon. 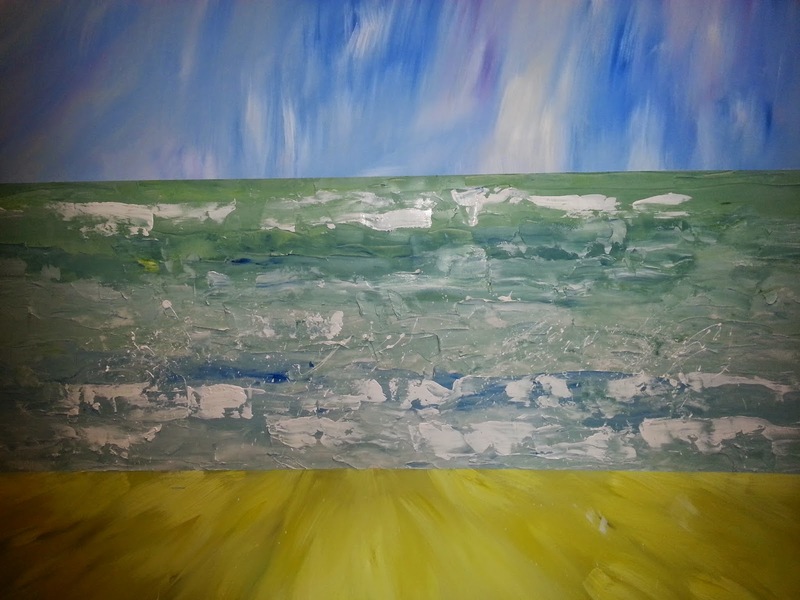 So the second landscape - is actually a seascape - the sea on the horizon. The patient has the chance to identify with the horizon, the mid ground of the landscape, and then the details of the tree - and the passing of time and the seasons. 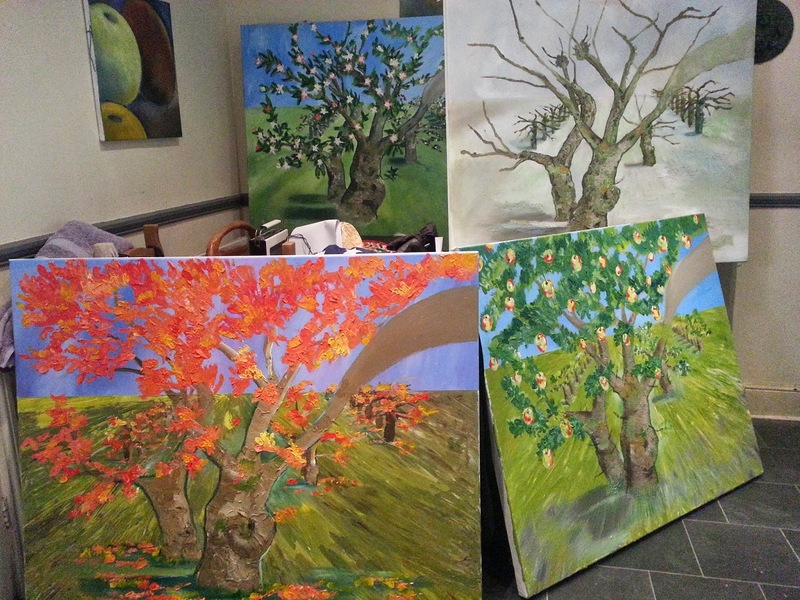 The final painting in the sequence will be a simple still life - of the fallen apples from the tree. When all the work is completed I will try to find somewhere to show the work before they go onto the ward. I have enjoyed this project - and look forward to seeing it in situ. I am also going to turn elements of this blog into a book in order to raise further awareness and funds for creative projects on the ward. I will be looking to crowdsource the costs of the book - and hope for any help offered!